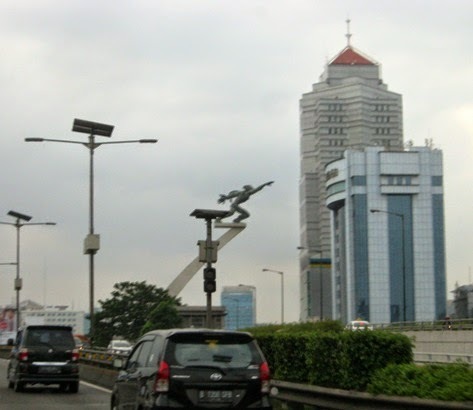 The Dirgantara Statue or better known as the Pancoran Statue is one monument located in South Jakarta. The first idea of this statue making is from Sukarno the Indonesia President who wanted to be made a statue described the Indonesian aviation or aerospace. 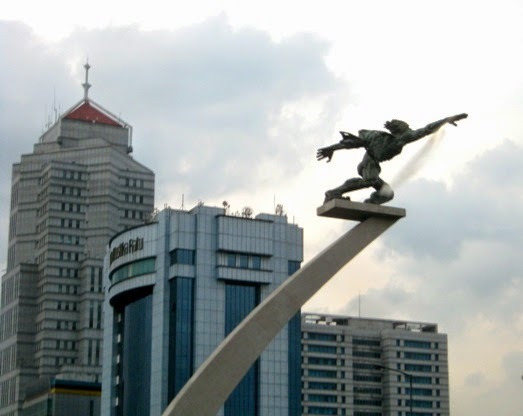 This statue represents a spaceman which expresses the Indonesia courage spirit to explore the skies. The statue installation finally completed by the end of 1966 (source:Wikipedia). I captured the statue from a moving car while passing by on a toll road. Just two quick shots. Amazing statue,it's a pity,lots of statue in my country have been removed in the name of Islam. Yes, wonderful photo, sculpture really nice !! Very well captured from the moving car! Cool looking statue! Great shots from the car. Have a happy weekend! Good day to you Lina, wonderful shot of this lovely statue and buildings. Cool statue and nice shots.